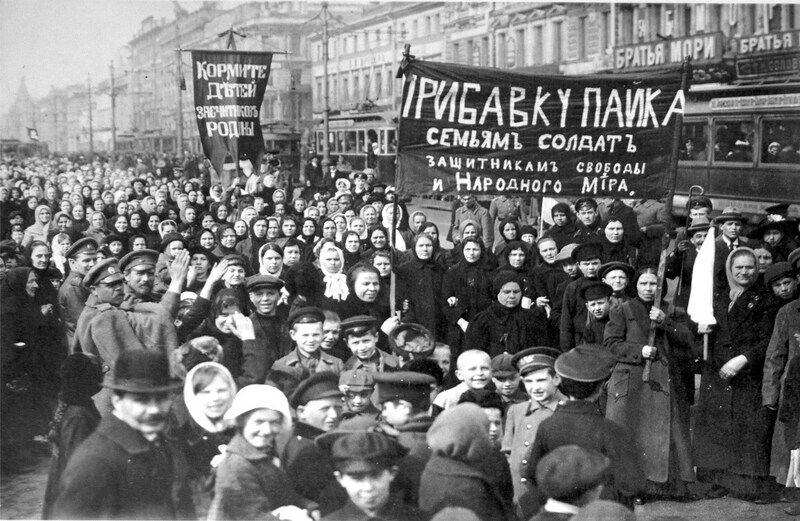 The first International Women's Day was celebrated 103 years ago by revolutionaries in Russia. A March 8, 1917 demonstration led by Alexandra Kollontai and other organizers. The following article was published in Pravda one week before the first celebration of the “Day of International Solidarity among the Female Proletariat” on March 8, 1913. In St Petersburg this day was marked by a call for a campaign against women workers’ lack of economic and political rights and for the unity of the working class, led by the self-emancipation of women workers. What is “Women’s Day”? Is it really necessary? Is it not a concession to the women of the bourgeois class, to the feminists and suffragettes? Is it not harmful to the unity of the workers’ movement? “Women’s Day” is a link in the long, solid chain of the women’s proletarian movement. The organized army of working women grows with every year. Twenty years ago the trade unions contained only small groups of working women scattered here and there among the ranks of the workers’ party . . . Now English trade unions have over 292,000 women members; in Germany around 200,000 are in the trade union movement, and 150,000 in the workers’ party; and in Austria there are 47,000 in the trade unions and almost 20,000 in the party. Everywhere — in Italy, Hungary, Denmark, Sweden, Norway, and Switzerland — the women of the working class are organizing themselves. The women’s socialist army has almost a million members. A powerful force! A force that the powers of this world must reckon with when it is a question of the cost of living, maternity insurance, child labor, and legislation to protect female labor. There was a time when working men thought that they alone must bear on their shoulders the brunt of the struggle against capital, that they alone must deal with the “old world” without the help of their womenfolk. However, as working-class women entered the ranks of those who sell their labor, forced onto the labor market by need, by the fact that husband or father is unemployed, working men became aware that to leave women behind in the ranks of the “non-class-conscious” was to damage their cause and hold it back. The greater the number of conscious fighters, the greater the chances of success. What level of consciousness is possessed by a woman who sits by the stove, who has no rights in society, the state or the family? She has no “ideas” of her own! Everything is done as ordered by the father or husband . . .
Social-Democracy abroad did not find the correct solution immediately. Workers’ organizations were open to women workers, but only a few entered. Why? Because the working class at first did not realize that the woman worker is the most legally and socially deprived member of that class, that she has been browbeaten, intimidated, persecuted down the centuries, and that in order to stimulate her mind and heart, a special approach is needed, words understandable to her as a woman. The workers did not immediately appreciate that in this world of lack of rights and exploitation, the woman is oppressed not only as a seller of her labor, but also as a mother, as a woman . . . However, when the workers’ socialist party understood this, it boldly took up the defense of women on both counts as a hired worker and as a woman, a mother. Socialists in every country began to demand special protection for female labor, insurance for mother and child, political rights for women, and the defense of women’s interests. The more clearly the workers’ party perceived this second objective vis-à-vis women workers, the more willingly women joined the party, the more they appreciated that the party is their true champion, that the working class is struggling also for their urgent and exclusively female needs. Working women themselves, organized and conscious, have done a great deal to elucidate this objective. Now the main burden of the work to attract more working women into the socialist movement lies with the women. The parties in every country have their own special women’s committees, secretariats, and bureaus. These women’s committees conduct work among the still largely non-politically conscious female population, arouse the consciousness of working women, and organize them. They also examine those questions and demands that affect women most closely: protection and provision for expectant and nursing mothers, the legislative regulation of female labor, the campaign against prostitution and infant mortality, the demand for political rights for women, the improvement of housing, the campaign against the rising cost of living, etc. Thus, as members of the party, women workers are fighting for the common class cause, while at the same time outlining and putting forward those needs and demands that most nearly affect themselves as women, housewives, and mothers. The party supports these demands and fights for them . . . The requirements of working women are part and parcel of the common workers’ cause! On “Women’s Day” the organized demonstrate against their lack of rights. But, some will say, why this singling out of women workers? Why special “Women’s Days,” special leaflets for working women, meetings and conferences of working-class women? Is this not, in the final analysis, a concession to the feminists and bourgeois suffragettes? What is the aim of the feminists? Their aim is to achieve the same advantages, the same power, the same rights within capitalist society as those possessed now by their husbands, fathers, and brothers. What is the aim of the women workers? Their aim is to abolish all privileges deriving from birth or wealth. For the woman worker it is a matter of indifference who is the “master,” a man or a woman. Together with the whole of her class, she can ease her position as a worker. For bourgeois women, political rights are simply a means allowing them to make their way more conveniently and more securely in a world founded on the exploitation of the working people. For women workers, political rights are a step along the rocky and difficult path that leads to the desired kingdom of labor. The paths pursued by women workers and bourgeois suffragettes have long since separated. There is too great a difference between the objectives that life has put before them. There is too great a contradiction between the interests of the woman worker and the lady proprietress, between the servant and her mistress . . . There are not and cannot be any points of contact, conciliation, or convergence between them. Therefore working men should not fear separate Women’s Days, nor special conferences of women workers, nor their special press. Every special, distinct form of work among the women of the working class is simply a means of arousing the consciousness of the woman worker and drawing her into the ranks of those fighting for a better future . . . Women’s Days and the slow, meticulous work undertaken to arouse the self-consciousness of the woman worker are serving the cause not of the division but of the unification of the working class. This article was transcribed by Sally Ryan for marxists.org. Alexandra Kollontai was a Russian revolutionary.